Why Tucker Pup's Dog Grooming? Many shops have limited days, including not providing grooming on Sundays. We provide full grooming services, including haircuts and deshedding, seven days per week. This gives you a much easier ability to get the date and time you want, because we spread out the appointments over the week and don't require a long lead time when making your reservation. We start grooming at 8:30am on weekdays. This enables you to have your dog groomed before going to to work, which is especially possible given that many breeds take about an hour. In addition, if your dog is boarding with us, we can provide an exit bath first thing in the morning, so you can pick him up early and have him smell as fresh and clean as possible before going home. We also perform grooming until 6pm, four days per week. 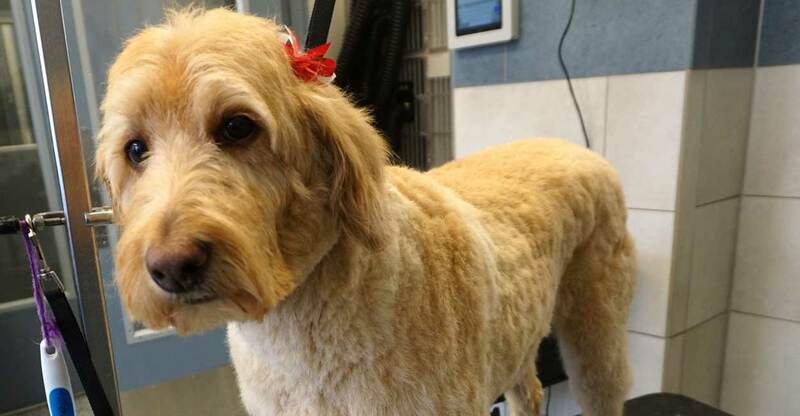 Later availability gives you more opportunity to bring your dog in for grooming after work. In addition, if your dog is staying for daycare or boarding, we can provide an exit bath very late in the day, almost up until the time we close. Ever gone to a grooming shop and found them hard to reach? Maybe they don't answer their phones, are closed on certain days of the week, and take a long time to call you back? We don't think that's acceptable, nor should you. We have friendly, professional staff members answering calls every single day of the week (including Sundays), all day long. The vast majority of our calls are answered with a live voice. If you happen to reach our voicemail, it's because we're with another customer, but we are committed to calling you back in a very timely manner. A lot of grooming shops force you to drop off your dog early in the morning, then pick him up at the end of the day. At Tucker Pup's, you can drop off your dog at the time of your appointment, and pick him up when he's ready. Your dog will be much less stressed as a result. Please note that you can drop off earlier than your appointment time if necessary. Unlike many grooming shops, we finish working on a dog before moving on to the next. As a result, your dog will typically be ready within an hour or two, not waiting in a cage all day. Our groomers are very experienced and produce beautiful dogs - we don't accept anything less than high-quality results. If you're not happy, bring your dog back and we'll make it right. Many grooming shops try to go cheap with their shampoos, which can cause skin irritation, plus they wear off very quickly. At Tucker Pup&apos;s, we don't skimp on the good stuff. The shampoos we use are high-quality and all-natural. so they are gentler on your dog's skin, and will leave your dog feeling softer and smelling better than ever. If you've been going to a different groomer, you will likely tell the difference in our shampoos right away. Tired of your dog shedding all over your clothes, your home, your car, and your friends? So many people just live with this frustration, but you don't have to! We offer a service called 'deshedding' that works wonders for most dogs that shed. It is a multi-step process that removes dead hair follicles from the bottom layer of your dog's fur. These follicles are what cause shedding, because they become loose and fall out of your dog's skin. In our experience, most dogs who get this done will not shed for a month or more. Please note that there are many factors that can cause shedding, including a non-healthy diet or a medical issue. Deshedding will not be as effective if these factors are present - ask your vet for advice. In addition, after receiving deshedding service, you still may need to brush out your dog for a day or two afterwards - this is normal, as some hair follicles will have been loosened but not completely removed during the process. If your dog is shedding after a few days, bring it back and we can try again. If the issue persists, we will suggest seeing a vet for underlying reasons that you may need to address. Many dogs don't like getting their nails clipped, and some have nails that may bleed easily because the vein on the inside may be hard to identify and that has grown out close to the edge. We offer nail grinding for these dogs as an alternative to clipping. It can be much less stressful for them, and reduces the risk of clipping into the vein. Vets recommend brushing your dog's teeth regularly, but this can be challenging to keep up with, and may not be realistic based on your dog's temperament or personality. We offer teeth brushing, with brushes and toothpaste made specifically for dogs. We also can add PetzLife gel to help loosen and remove plaque buildup. You can schedule this service as part of your dog's haircut or bath, or we can just provide the teeth brushing as a standalone service. Our groomers are very friendly, easy to work with, professional, and are committed to providing excellent customer service. We don't accept anything less. Many places don't allow you to speak with the groomer. We don't believe in that here, because there is too much chance for miscommunication, and the groomer needs to determine what is realistic based on the condition of your dog's coat. When you check in for your reservation, you will meet with the groomer to review your instructions, create a two-way dialogue, and build a relationship based on trust. Some dog businesses have a grooming area that they would rather you didn't see because it may be cramped, not very clean, and in poor condition. 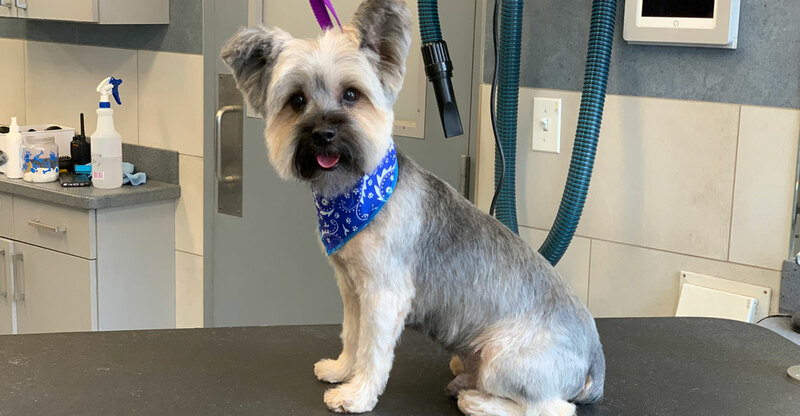 We have a dedicated grooming room that is spacious, has lots of natural light, that you can see from the lobby, is kept clean on a daily basis, and that we're proud to show off. Tucker Pup's sports professional grooming tubs that are designed to provide total comfort, safety, and bathing effectiveness for your dog. Each tub has a non-slip ramp, and a raised non-slip floor that keeps your dog's feet out of the soapy water. The tubs are large enough to handle dogs of all sizes. Some of our tubs even raise and lower, if your dog is unable or unwilling to climb in. We don't just rub soap onto your dog - we powerwash her with an automatic shampoo dispenser. This goes much farther in removing dead skin, dirt, and hair follicles from her coat. The bottom line is that your dog will be cleaner, feel softer, and have a more massaging experience than at other grooming facilities. Most grooming shops use a paper calendar for scheduling, and while some use paper to store notes, many use nothing at all. We have a highly sophisticated computer system to track every detail about your grooming reservations. For example, our groomers store notes about your instructions, the blades they use and other internal comments, and how your dog behaved. These notes, along with lots of other data such as your pricing history with us, are updated with each reservation, stored forever, and are easily accessible within both the lobby and the grooming room. This system is far superior to paper and enables us to deliver a consistent experience to you each time you come here. Want to make a grooming reservation from our website without calling us? No problem. Make your request using our Customer Request tool and we'll call you back or simply send an e-mail confirmation based on your preference. We instantly send out e-mail confirmations when you make a new reservation or change an existing one. We also send out an e-mail reminder when your reservation is right around the corner. This makes it easy for you to remember your reservation, plus minimizes the chance for any miscommunication about your date, start time or services requested. Our prices reflect the quality we provide, and are very typical of the grooming industry. We don't want to be the lowest price, but we also don't want to be the highest. We believe you will find that our prices are fair and reasonable. We make every attempt to keep your price consistent from one grooming reservation to the next. This is true even if your groomer is different each time. The only difference is if your dog required a lot of extra work, such as dematting or shaving, or you requested different services than in the past. Scenario: your dog gets groomed here, and suddenly you're getting compliments at the dog park and on walks, plus you're even showing off a wallet full of photos at work. Someone says "Your dog's grooming is fantastic - where did you get that done?" Here's where we grease the skids a little: for every new customer you send our way who mentions your name and spends at least $30 with us, we will give you a $30 referral bonus. It easy and automatic, and there's no limit to the number of referral bonuses you can earn. Work during the day and can't bring your dog over? Because your dog can play in daycare all day if you have a grooming appointment, you can drop off as early as 7am and pick up as late as 7pm. If your dog is staying with us while you are out of town, we can have her looking sparkling clean and shiny when you arrive back home. We can even provide daily brushouts to help ensure your dog's hair doesn't become matted.